This article appears as part of Native America, a four-part series that explores the world created by America’s First Peoples. Reach back 15,000 years to reveal massive cities aligned to the stars, unique systems of science and spirituality, and 100 million people connected by social networks spanning two continents. Premieres October 23, 2018. Visit the Native America site for more. My first flavor memory is the spicy taste of bear root, mixed with gritty San Juan Mountain soil, on my tongue and the sweet maple aroma in my nose. The second is blue corn mush with just a hint of honey. To tell the tale of the foodscapes in these homelands, from these snow-capped, 14,000 feet peaks to the scorpions and cactus in this high desert, is to define the juxtaposition of its people. My people; resilient, strong, rooted. Our ancestral memories reside on the winds here and guide these earth-toned hands through the ceremonies of our ecosystems. Fanny and Manuel Baca, my paternal grandparents, are my compass through Indigenous Foodways and living with the land. My grandfather is Bear Root. He is loading up the hatchback of the baby blue Ford Pinto with a couple dozen milk jugs to collect spring water. He spends late spring nights pushing seeds into the earth, eating wild onions and high mountain lake trout on cool summer evenings, learning to harvest elk and deer alongside the bounty of the garden, and sneaking sips of chokecherry wine. My grandmother is Blue Corn. She is homemade tortillas. She’s peeling gunny sacks-full of green chile, grocery bags filled with purslane and wild spinach, laughter as my cousins and I shake piñon nuts onto blankets, ice cream cones and candy, but most importantly she is the matriarch; the nourishment, the patience, the discipline, and the prayer. As I look behind me, I can see the botanical map – their lineages maintained, from the Tewa, Dinè, and Nuuciu, and how these mountains are as bountiful and diverse as our people. How does one define entirely distinct cultures through the medium of our indigenous foods? What dye plants were used to color the hand-spun threads that connect us? How do we interface with this colonial model of “civilization” and maintain our cultural foodways in the face of continued ecocide in our homelands? These questions reverberate in this, and I dare say ALL, Indigenous hemispheres and are currently being confronted through the Indigenous Food Sovereignty Movement – a movement I find myself caught in the tides of, and one that is as personal as it is communal in its breadth. The teachings and tools I was blessed with by my grandparents, carry me into this territory as an eager student and often wary teacher – positions I humbly engage in daily – and connect our cosmologies as you read this. The American Indian Religious Freedom Act was enacted August 11, 1978, two-and-a-half years after I was born. That means the ceremonies guiding our relationship with our food have only been legal for 40 years. The modern landscape of foods, or pseudo foods to be more direct, is one rarely deciphered, unfortunately by design. It has become a maze for those caught in the systemic traps of socioeconomic disparities, the poverty consciousness imposed through settler colonialism, that we navigate with undernourished bodies, manipulated understandings, and empty pockets. It is here that I navigate through heart disease, thyroid problems, high blood pressure, and systemic levels of diabetes in my communities. It is here that the battles must be fought. And it is here that I hold myself accountable to my people. Just as my grandparents nourished, tended, sang to, and prayed over the seeds they planted with me, I now find myself planting alongside our elders and children as we find our way through the imposed darkness of warfare against our Indigenous food systems and tending the sacred commitments we have to our homelands and lineages. Coal-roasted Gete Okosomin squash bisque. Karlos Baca picks a Gete Okosomin squash. The one that’s more round has been cross-pollinated with a pumpkin, which is a rare event. 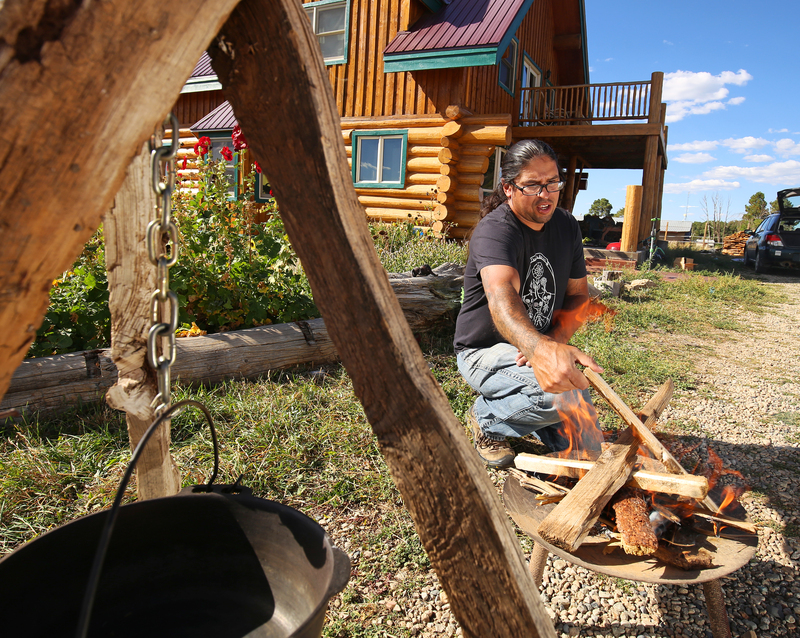 Karlos Baca makes a fire to roast and cook the Gete Okosomin squash for a coal-roasted squash bisque. Ingredients used to season and top the coal roasted Gete Okosomin squash bisque. 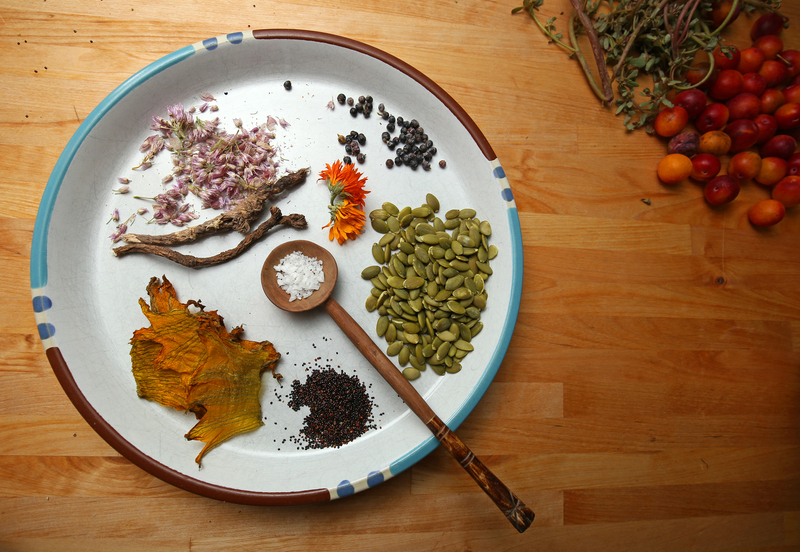 Clockwise: juniper berries, calendula, pumpkin seeds, salt, wild amaranth seed, dehydrated squash blossoms, biscuitroot and wild onion flowers. Karlos Baca roasts a Gete Okosomin squash stuffed with purslane and juniper. 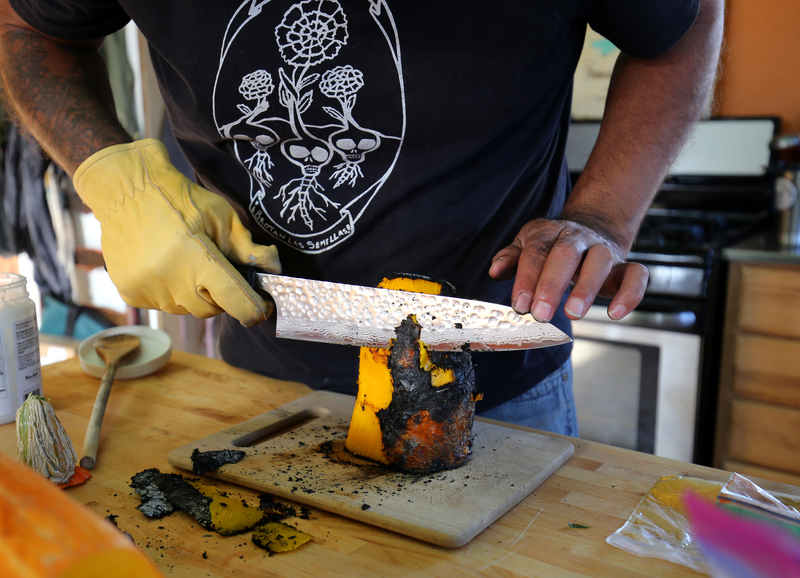 Once the squash is ready, the charred skin is removed. All ingredients are ready for the Dutch oven outside. Squash, pitted wild plums and wild onion flower comes to a boil. When the liquid has reduced by half, everything, except for the toppings, goes into a food processor. Karlos finishes the bisque by sprinkling calendula petals over the pumpkin seeds. Coal-roasted Gete Okosomin squash bisque. It has a surprising buttery taste without having any butter or animal products in it. If you’re not familiar with the flavors of the foraged ingredients, they all work together to elevate the great flavor of the squash. 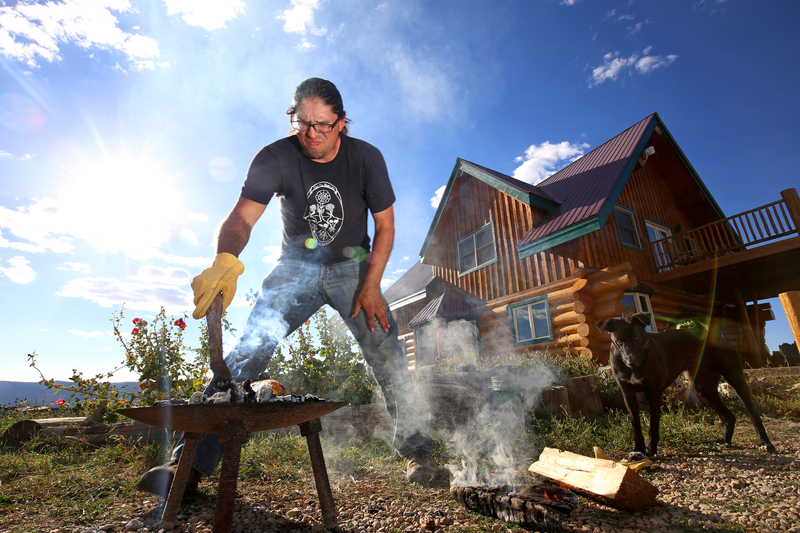 Experience Karlos Baca's family recipe that tells the tale of the foodscapes in his homelands. Remove seeds from squash and season cavity with Purslane, Juniper, and Salt. Roast squash directly in hot coals, rotating often, until soft. Remove from coals and cut off blackened exterior. Cut into large chunks. In a pot, cast iron preferable, add Sunflower Oil, Squash, Wild Plum, Biscuit Root, Wild Onion Flowers, and Salt. Sautèe until browned and deglaze with water. Reduce liquid by half and remove from heat. 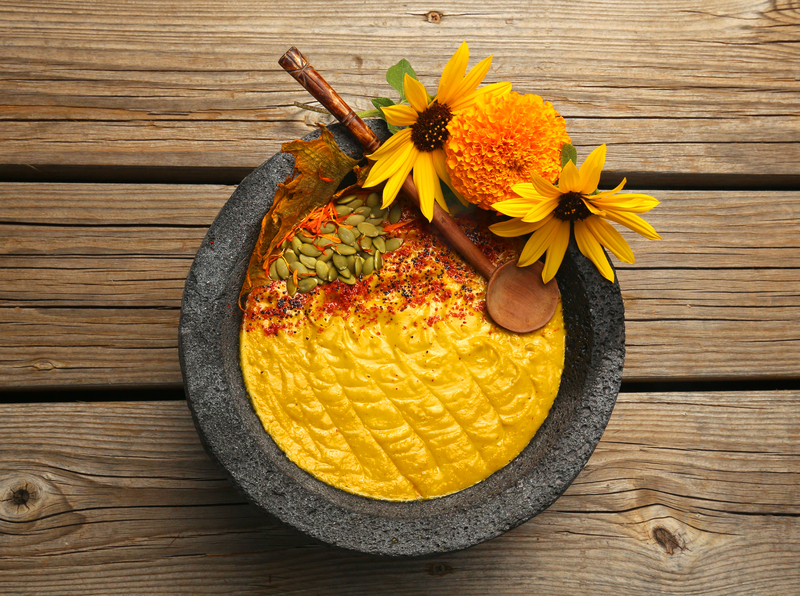 Distribute evenly between four bowls and top with 3 Leaf Sumac, Wild Amaranth Seed, Squash Blossom, Pumpkin Seed, and Calendula Petals. 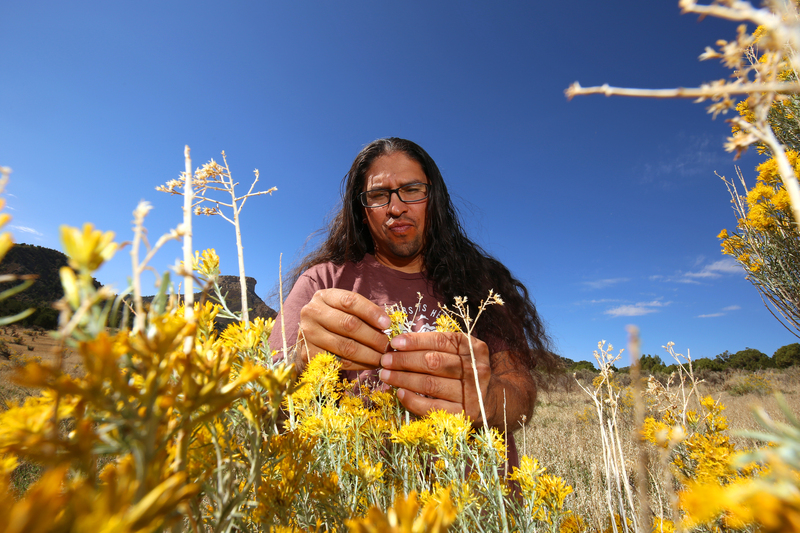 Karlos Baca is an Indigenous foods activist and founder of Taste of Native Cuisines, an Indigenous food cooperative based out of the Southern Ute territory in southwestern Colorado. He focuses on pre-colonial Indigenous foodways, which includes cooking, seed saving, agriculture and foraging. He spends most of his time teaching in schools, working to help decolonize food systems, and pushing for more Indigenous food sovereignty initiatives on a tribal level. He’s a member of the I-Collective, a group of Indigenous chefs, activists, herbalists and seed and knowledge keepers. Karlos is Tewa, Dinè and Nuche.